The Long Island Index, a project of the Rauch Foundation, today launched a new interactive map that enables Long Islanders to access easily an extraordinary array of data about Long Island and its communities. The map – available at www.longislandindexmaps.org – provides a wealth of information about the region, its characteristics, and key indicators – as well as its individual communities and their attributes. The map enables users to enter the name of a community or a specific street address and have instant access to a range of valuable information. By entering a street address, for instance, a consumer – either a resident or someone interested in moving to the area – can learn about local amenities, nearby schools, the immediate neighborhood, utility service providers, elected officials, and other topics. 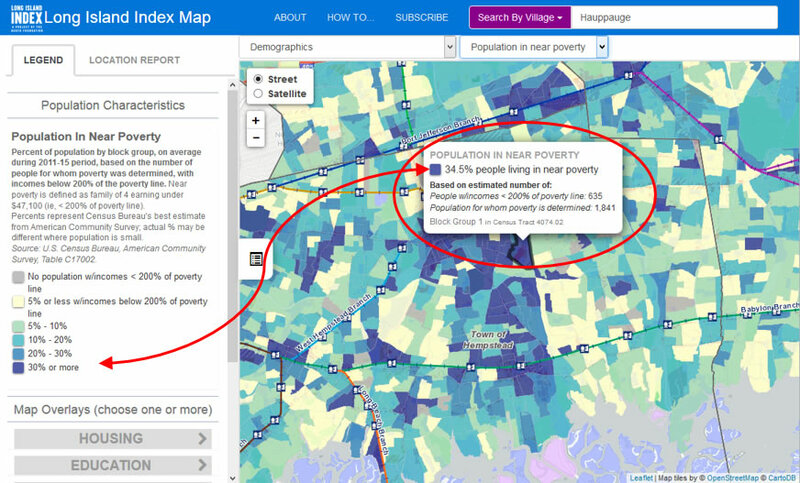 The map offers the latest-available data and features cutting-edge mapping tools to help policymakers, community groups, educators, students, the media, and the general public learn about the region and its communities. It relies on the latest web technology, which invites users to interact with the map, enables the map to be displayed on any device including tablets and mobile phones, and renders the map and data quickly. You can simply move your mouse, for instance, over map elements or tap them to display location-specific information. 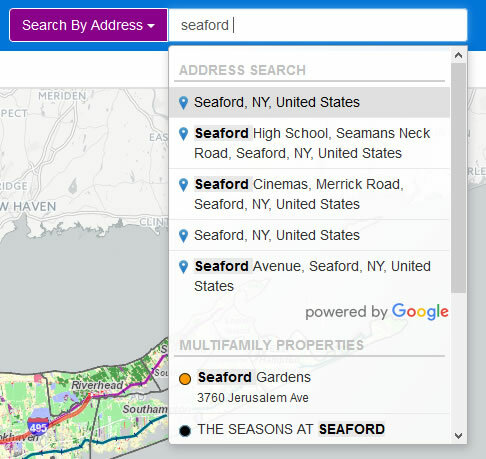 The map’s geographic search engine displays a single search box to locate villages, landmarks, street addresses, and other data on the map such as schools, multifamily properties, and more. Once a web user clicks in the box (without even typing), a list of options appears automatically. As one starts typing, results based on the text input are displayed (example at right), offering suggestions to the user about how to further customize the search and making it easy to select from the list of possible results. The map also features the latest data from the U.S. Census Bureau’s American Community Survey, showing population estimates by “block group” (small areas within villages or hamlets; see graphic at right) for the 2011-2015 period. This information represents the first local population estimates since the 2010 decennial census. It will continue to be updated leading up to the 2020 census. The map includes, among other data, the latest information on school districts and schools throughout Long Island. It provides the only online bird’s-eye-view of multifamily housing across both counties, displaying rental and coop/condo locations in an easy-to-use format. It also includes new data on water monitoring sites in both counties, displaying information compiled by Stony Brook University researchers as a vital indicator of the health of Long Island’s bays and harbors.